Before I left, R and I were in Connecticut visiting my grandmother. We do this as often as we can, since she's always a great time to hang out with, she feeds us really well, and the quiet of Connecticut can be such a welcome respite from the damn sirens those police men and firefighters who work around the block from us in NYC insist on using all the time. 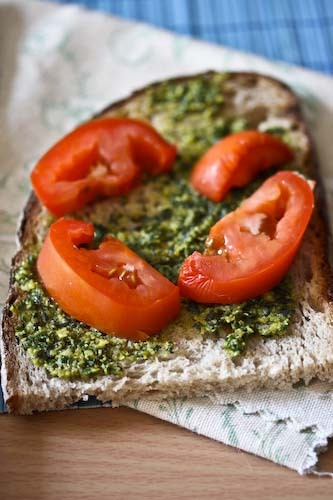 And if there's one dish that always reminds me of Nana, it's pesto and tomatoes. We were out there a little early for tomatoes, I'll admit. Usually they're the vine ripened kind actually ripened on a vine. In her garden. Heavy with juice and deeply red. The basil was always garden-fresh as well, and together they're irresistible. Last time, however, we had to make due with hothouse tomatoes (she was complaining, not me, just for the record). But really, Nana's pesto would be amazing smeared on cardboard. 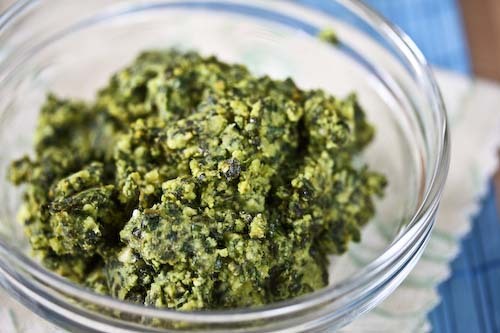 One of the things that makes this pesto better than any other pesto is the inclusion of parsley. Parsley and basil get along very well together. I may have let my inner glutton out a bit too easily at Nana's house, because I'm not sure anyone else really got any. Wish I could say I felt guilty. The picture above is of the batch she sent home with me. She added less oil to that one than to the one I demolished at her house, so that I could control the level myself. The recipe below calls for the correct amount of oil. Blend the first 6 ingredients in a food processor until they form a thick paste. Slowly add the oil, with the machine still on, until it becomes the consistency of butter. The pesto can be refrigerated for up to a week or frozen for longer. Did Nana grow her own parsley, too? I thought she did. Anyway, this was my favorite dish also. I would have it for breakfast with mozzarella cheese, fresh from the garden tomatoes and Nana's pesto. For lunch - same thing. And if I could get away with it for dinner as well. That settles it, I'm planting my own herb garden. I wonder if it will taste the same in Denver. Parsley also helps the pesto keep a nice green, fresh color. I use essentially your same recipe except I add a dash of lemon juice. My favorite way to eat it is EXACTLY as your picture suggests, on bread with tomato. Nothing better. This looks great. I have a ton of basil I need to use or loose. I might have to whip up a batch. I came across this recipe on foodgawker and made it this evening with walnuts and fresh parsley and basil from my garden. It was the best pesto I have ever made! a friend of mine just gave up a bunch of basil from her overflowing garden and now i definitely have some great use for it! Thanks!